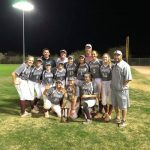 The Trivium Prep Lady Knights softball team has started out strong and remained consistent all year. Every player has contributed and been a part of this amazing season for our team. Starting the year off early we knew we wanted to claim victory over Chandler Prep. Corinne Vasiloff threw a gem that secured our victory. Middle School Softball tryouts will be Monday and Tuesday 11/6 and 11/7 at 3:45pm at Falcon Park on Goldie Field. Please contact coach Barker with any questions at robert.barker@advantagesolutions.net. Friday, March 31, 2017 5:30 PM Kingman Academy Of Learning High School AWAY 11 Trivium Preparatory Academy HOME 3 Game Recap Trivium Prep Lady Knights Varsity fell behind early and couldn’t come back in an 11-3 loss to Kingman Academy on Friday. Kingman Academy scored on a walk and a single in the first inning. Tuesday, March 28, 2017 3:45 PM Tonopah Valley High School AWAY 4 Trivium Preparatory Academy HOME 9 Game Recap Trivium Prep Lady Knights Varsity Jumps Out To Early Lead In Victory Over Tonopah Valley Trivium Prep Lady Knights Varsity grabbed an early lead on its way to a 9-4 victory over Tonopah Valley on Tuesday.